If you are new to cycling, here are a few things to think about to get you started in the right way. Get some decent padded shorts or leggings to stop your backside hurting so much. Get some sports glasses, they will keep your eyes protected from bugs, stones, sun and rain. 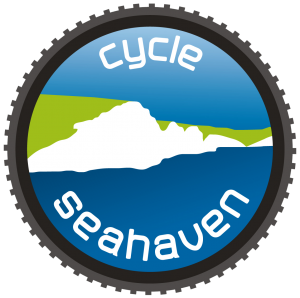 It is Cycle Seahaven rule that every rider on a club run must wear a helmet. Keeping your bike well maintained is a key to happy riding. Clean and oil your chain regularly. You’ll eliminate the dreaded ‘creak’ that cyclists hate, and more expensive parts like chainrings won’t wear out as quickly. Check your tyre pressure: recommended levels will be indicated on the sidewall. Low pressures lead to tyre wear and drain your energy. Fit mudguards in wet conditions. These keep you cleaner and help the person behind. Clean your bike regularly. Hosing down after a muddy ride is essential if you want to use your gears next time. Be sure to oil moving parts afterwards, keeping clear of brake shoes and pads. Learn how to fix a puncture, and always carry a repair kit (including tyre levers, patches or new inner tube, and pump). Stay hydrated. Always carry a water bottle or a hydration backpack. Avoid the dreaded ‘bonk’, where your body runs out of fuel and you grind to a painful halt. Consume around 100-250 calories every 30mins, whether that’s energy gels, cereal bars or a banana. A recovery drink after a long, hard ride will help the body repair itself, in conjunction with some rest. Key to this is protein, so aim to consume around 15-20g within 30mins of finishing if possible. This is the important one – we want you to be safe. The good news is that with the right mix of confidence and caution, city and country roads and tracks are yours for the taking. Build up some experience, and you’ll learn to read situations quickly and accurately. See and be seen – wear visible or reflective clothing and use lights on roads. If you’re going out for a long ride on your own, tell someone where you’re going and when to expect you back. A “Find My Phone” app on a tablet at home could be useful. Always carry ID. Learn some basic traffic-riding skills for the road. Be assertive, stay out of the gutter, and remember that you’ve got as much right to be on there as anyone else. Check out more details on CYCLING SAFELY. Smile! Riding bikes is fun. Acknowledge other riders, enjoy yourself, then eat cake, and don’t worry too much about having the ‘right’ gear or the ‘best’ bike. The best bike out there is the one that you enjoy riding. Use the drop down menu on the left to get more details.